Garrison Keillor, the host and creator of “A Prairie Home Companion” will undergo a medical procedure forcing him to cancel his Sept. 27 edition of the show. In a release Thursday announcing the cancellation of the Fitzgerald Theater show, 72-year-old Keillor said, “If you’ve noticed my upstairs bathroom light go on at 10 p.m., 10:10, 10:25, 10:40, etc., you know all you need to know. It’s no way to live, so I’ve found an excellent surgeon who will fix everything, and by October, I will be thinking more about truth and beauty and less about plumbing,” the Pioneer Press reports. Those with tickets to the Sept. 27 show should contact the Fitzgerald Theater box office by email (fitzgerald@mpr.org) for refunds. 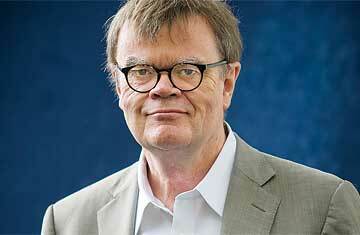 Keillor celebrated the 40th anniversary of the show this summer. The new season of “A Prairie Home Companion” kicks off Saturday Sept. 20 with a street dance and a live broadcast from the Fitzgerald Theater. The free event will go on as planned. The shows at the Fitzgerald run through Oct. 18. In November, “A Prairie Home Companion” will go on the road for broadcasts in Minneapolis, Duluth and Rochester. All other shows will go on as scheduled, MPR News says. I knew that that wood looked familiar. After careful analysis, it is plausible to conclude that NPR’s Studio One influenced the ‪design‬ of the studio of The Tonight Show Starring Jimmy Fallon. Here’s a photo of Jimmy Fallon and Tina Fey in Studio 6B and Scott Simon in NPR’s Studio One.